A teacher is educating her students about organ donation after her friend died of a brain haemorrhage. 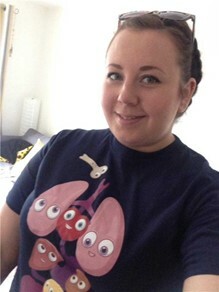 Emily Allcock, an English and drama teacher at The Island Free School, Ventnor, is an advocate of the Live Life Give Life charity, which raises awareness about organ donation. The 23 year old, of Sandown, has backed the charity’s latest campaign, The Orgamites, which uses cartoon organ characters to help children understand the importance of donation. Emily was inspired to spread the word after her friend, Beth Dykes, died of a brain haemorrhage at the age of 21 and her family chose to donate her organs because she had expressed interest but never signed up to the register. "It’s really important children have the opportunity to learn about organ donation, as they are the donors of our future," Emily said. "The pupils’ responses have been overwhelmingly positive. They are so caring and kind and have focused on what an amazing thing being an organ donor can be for people in need. "I’m really proud of how mature they have been and that they are always thinking about the needs of other people. They are amazing children and I’m really lucky to work with them." Emily said she had received positive feedback from parents and The Orgamites campaign had helped to get families talking.